All Products > "58416 Tamiya 1/10 Rising Fighter 2WD"
Aimed squarely at the beginner, but just a fun for the old hand, the all terrain 2WD Rising Fighter inherits all its great qualities and excellent performance from its predecessors The Hornet (Item 58336) and The Grasshopper (Item 58346) and also uses a similar body to that of other fighter series R/C cars. • Independent swing axles for the front suspension, a rolling rigid rear suspension, and large sized friction dampers effectively absorb shocks and bumps. • Bevel type diff gear. • Semi monocoque structure acts as the chassis strengthening part (Screws are used to secure the resin body to the bathtub chassis). • Fully enclosed gearbox preventing dirt and debris from interfering with operation. • Powered by a 540 motor (included). • Grooved front tires and rear spike tires ensure excellent traction for any surface. • Stylish resin molded body. 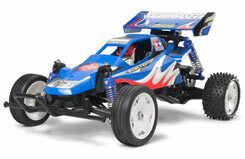 • Running 7.2V battery & charger and 2-channel R/C system separately required.